Last month Finding Novyon released his epic Keep Going EP, heading the DIY movement here in Minneapolis, with aggressive and impressive self-promotions and building himself a huge Twitter and social media following in the process. He has come out with five different releases in the past two years alone, with the Travis Gorman collaboration, The Food Network, set to debut this spring. His incredible production and lyricism set him apart from the pack, so be sure not to miss his second 7th St appearance. His guest spot this past August at our So Cold Dance Party is not to be forgotten. First Ave veterans and one of Minneapolis' favorite indie rock bands France Camp will be returning to their stomping grounds, the 7th St Entry tomorrow night. They will be sharing headlining duties with Madison band Dolores and Minneapolis rock trio Whatever Forever. France Camp is no stranger to the First Ave venues, hosting his unforgettable album release party this past year, and assisting other large names such as FIDLAR, Stereo Confession, and The Vaccines recently. Their LP on the local and rising label Forged Artifacts has been making its way around the music-sphere in the past year, and is incredible to be heard live. 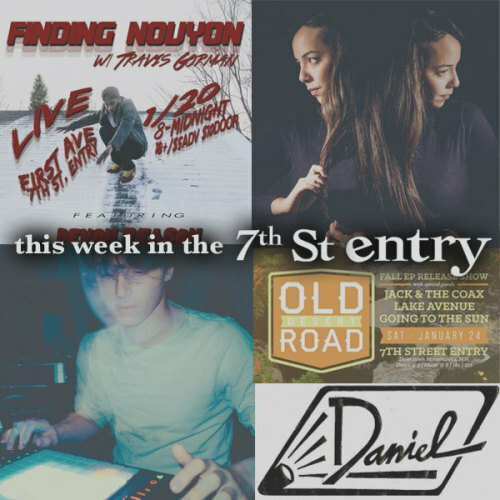 Exciting local musician Daniel will be headlining his first First Avenue performance this Thursday night. This past October lead singer Daniel Olson shared the 7th St stage with Otis Heat, in one of the most high-energy sets we saw last year. His cosmic indie rock will remind listeners of the Ziggy Stardust age of David Bowie, while still providing a gritty rock feel that Twin Cities concertgoers are known to love. His fabulous Spaceside Summer EP was released last August, and was mastered by local producer Aaron Sunde to critical acclaim. They've been mixed and mastered to perfection, with drummer Mike Horick on the sticks. Singer/producer Elliot Moss, hailing from New York City released his debut album, Highspeeds in 2013 to instant acclaim and is still riding a wave of indie buzz leading up to his Friday 7th St show. His beautiful falsetto, layering vocals and synths all around his music effortlessly, provides for a wonderful downtempo electronic soundscape, working in guitars and various instruments into his mixes. His work as a visual artist also may contribute to his new-age sounding music, releasing his DIY album in which he self-produced, mixed and recorded. This extremely talented musician will be sure to put on a great 7th St debut, don't miss it this Friday night. Rob Phillips led group Old Desert Road will be hosting their release party at the Entry this weekend, being their first time headlining the venue. They've been joined previously by other local groups, with this Saturday being the exception. The four exceptional musicians that make up the group are guitarists Rob Phillips and Jeff Kruse, piano and singer Jennifer Peterson, and percussionist Eric Kramlinger. They will be performing their newest Fall EP, which is currently being recorded at local Hideaway Studios in Northeast Minneapolis. Their Tour Guide EP was very well received here in the Twin Cities and we are more than excited to see the new material the group has been cooking up. Former Minneapolis resident and singer/songwriter Quinn Tsan will be bringing her talents to the Entry stage this Sunday night, now based out of Chicago. Her history mirrors the upbringing of the eccentric FKA twigs, being a classically trained dancer, turned backup singer and dancer, turned full blown solo artist. Her dance moves and music have been swooning audiences for years now, and her soft vocals and beautiful lyrics have culminated to produce a very close connection between Quinn and her listeners. She is sure to put on an extremely intimate set, perfect for her deeply personal music.